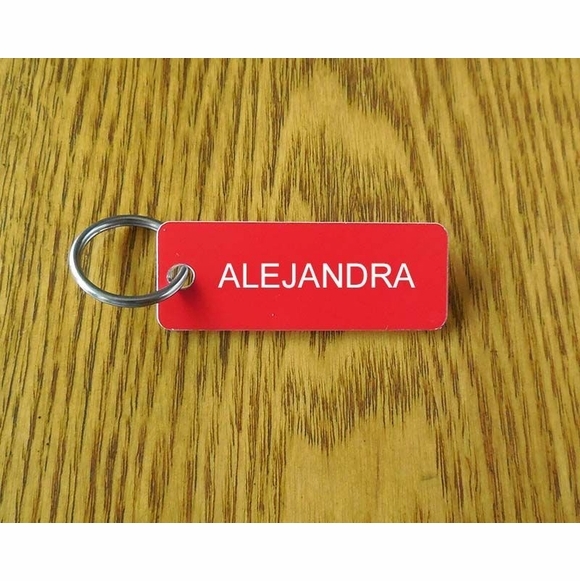 Key Tag - - engraved with your custom message. Personalize your tag with whatever you wish to say. Put on today's trendy saying, slogan, quote, #hashtag, instagram user name, initials, room number, house number, ham call sign, boat name, identification number, dog or cat name, favorite sports team name, etc. Fast turnaround; ships in 1-2 days. For your locker key, gym bag, tackle box, trailer hitch lock key, salon door key, outboard lock key, marina key, bathroom access key, padlock key, etc. Made from sturdy, non-rusting and UV-stabilized laminated acrylic 1/16" thick with engraved personalization. Personalization is permanently engraved, not painted or printed on. Up to ten (10) characters per engraved line. Safety radius at each corner. Includes a non-rusting stainless steel 3/4" split key ring. Dimensions: 2"W x .75"H x 1/16" thick. Colors: sky blue with white characters; black with white characters; white with black characters; brushed gold with black characters; brushed stainless with black characters; evergreen with white characters; red with white characters; yellow with black characters; brown with white characters; wood tone with white characters; beige with brown characters; and pink with white characters. Recommended as a budget friendly and special gift for friends, nieces, nephews, nannies, teachers, household help, babysitters, caretakers, manicurists, beauticians, barbers, and more. Comfort House # J0078 by Shayla's Tags.